L responds to my query about whether she enjoyed herself at the gym on Friday morning by saying she did but she felt less gym bunny and more gym bag. Ha ha. I do love the self-deprecating humour. We go dog free and it seems to go well. Just like the old days we end up in bed afterwards where we finally break open the bottle of Grey Goose from Christmas. On Saturday we head over and do Leamington parkrun. L’s done it a few times but it’s the first time Daughter and I have done it. The off road course isn’t as bad as I feared because the ground is very firm. Afterwards we meet Son and his gf for breakfast in the delightfully named Fat Birds Café. 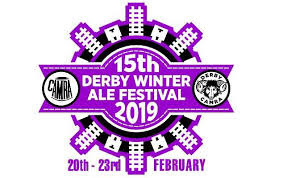 In the evening we do our second Beer Festival in eight days as we head over to the Derby Beer Festival for a ‘moderate’ session. I do have a sixteen and a half mile run tomorrow but this strategy seemed to work quite well at Prestwold last weekend. My beers - Brass Castle Saltwater Taffy Brown Bitter 4.5% (N. Yorks), Yeovil Night Train Porter 6.0% (Somerset), Downlands Devils Dyke Porter 5.0% (West Sussex), Double Top Madhouse Porter 5.2% (Notts) and Harbour Puppy Porter 4.6% (Cornwall). L’s beers - Brass Castle Quench Pale Ale 3.2% (N. Yorks), Black Storm Porter 5.2% (Tyne & Wear) and Brass Castle Saltwater Taffy Brown Bitter 4.5% (N. Yorks).